We offer Chautauqua Lake lakefront views from all of our rooms at the Maple Springs Lake Side Inn. 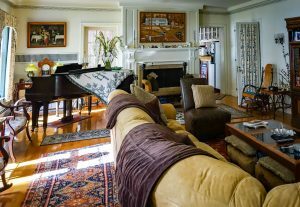 Whether you are looking for a weekly rental or just staying a couple of days, we have a room to suit you at our Chautauqua lodging. Need more space? Try one of our one or two bedroom suites that rent by the week, Saturday to Saturday. All rooms offer private baths and lake views. 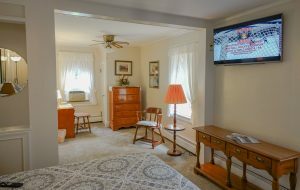 Our inn is located only 12 minutes from Jamestown, NY, home of the Lucy-Desi Museum, Jamestown Savings Bank Ice Arena, and so much more. Are you used to staying at a hotel or motel and have never stayed at a Bed & Breakfast? 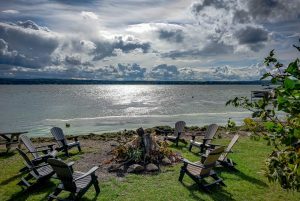 The Inn is on the east shore of Chautauqua Lake, diagonally opposite is the world famous Chautauqua Institution, where outstanding cultural programs are held during the summer season. Transportation is available to all area events with advance notice. 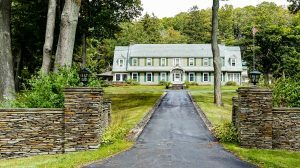 The eleven acre private grounds, with rolling wooded terrain invite hiking, picnicking, and volleyball in the summer. We also invite you to enjoy the Inn’s private beach and dock. Go fishing, canoeing, boating, or just bathe in the sun. 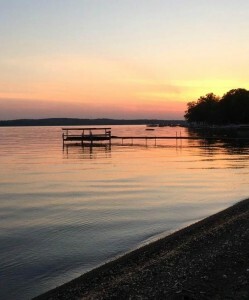 Sunsets and bonfires have become a rite of passage at the Maple Springs Lake Side Inn. No matter what season you choose for your visit, the number of things to do is countless. Many of our winter guests ski at local ski resorts, cross country ski, snow shoe, ice fish, and most popular of all, snowmobile on the many local trails. We have several guests who come year after year to enjoy the local trails. Fall guests are blown away by the beautiful fall foliage (as pictured in our photo gallery). Often the weather still permits boat rides on Chautauqua Lake which provides scenery like no other. Hiking, biking, wine tasting, theater and dining are just a few of the fall activities. Spring is when our weather is just breaking, the snow is melting, the flowers are blooming and there is lots to do. Golf courses start to open, the small village boutiques start their seasons, fishing and boating are just beginning. Of course summer is our most popular time of year. World famous performers visit the Chautauqua Institution, boating, swimming, sailing, water skiing, & fishing are at their peak, all local antique shops and boutiques are open for business, local amusement parks are geared up and running and a restaurant to suit any taste awaits you. The National Comedy Center is the newest attraction in the area that you must visit. This new interactive comedy museum is going to be one of the highlights of your stay! You are sure to laugh and learn as you make your way through the exhibits! Stay any two nights and receive 2 free tickets* to the National Comedy Center located in Jamestown NY.